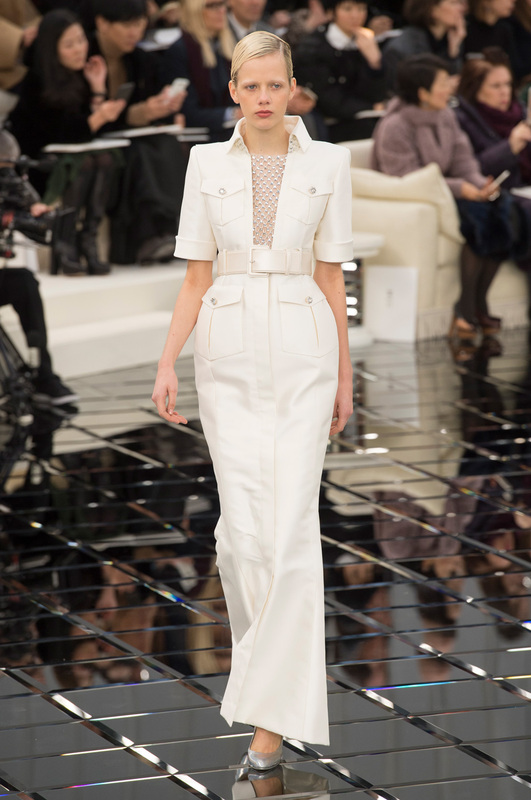 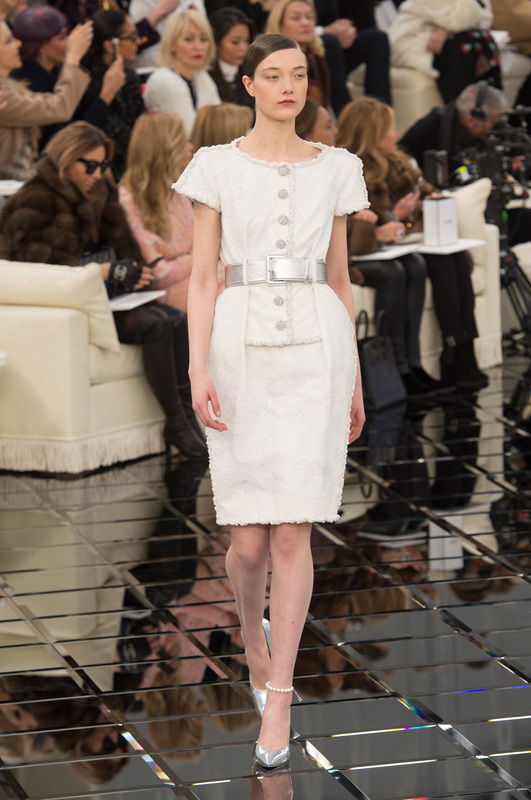 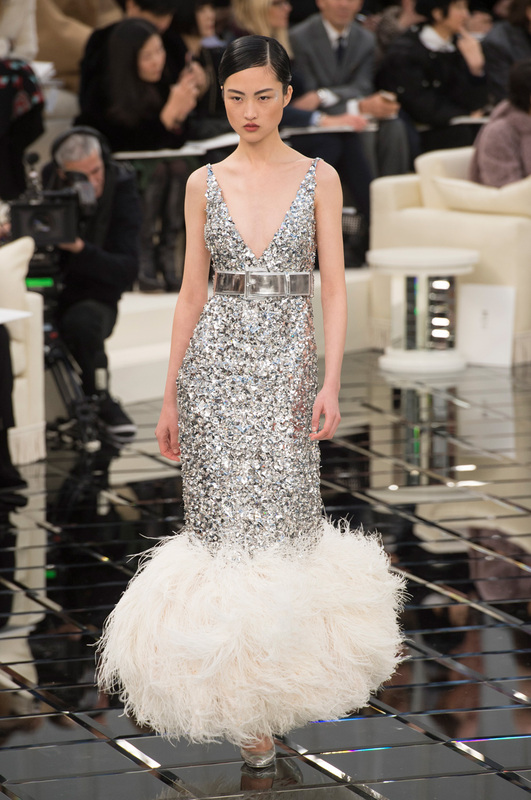 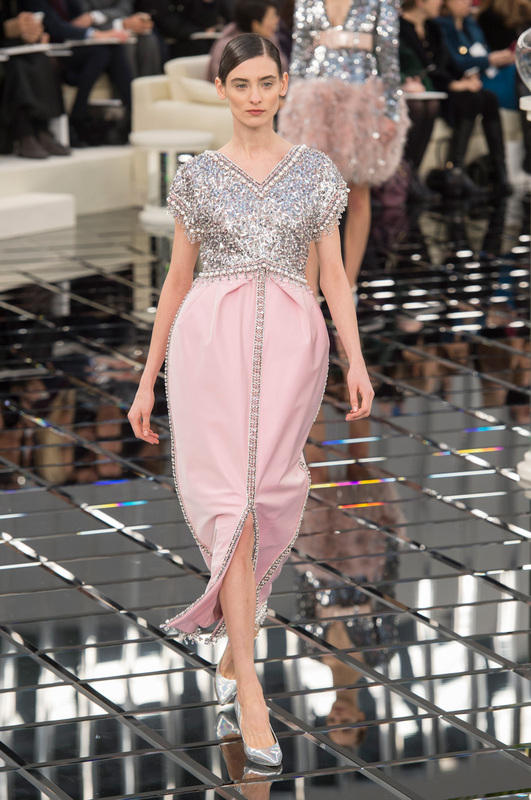 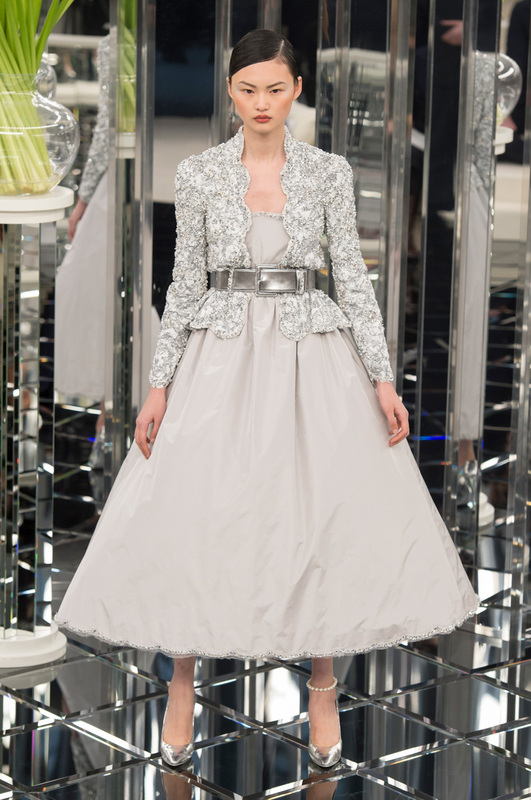 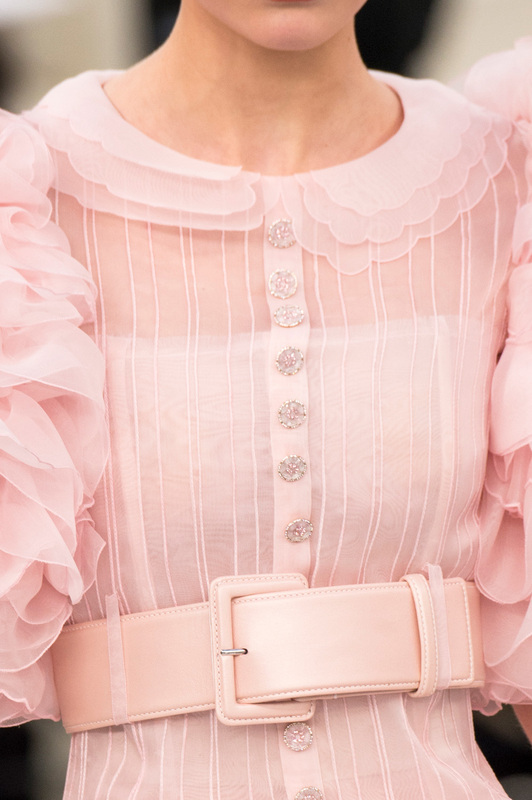 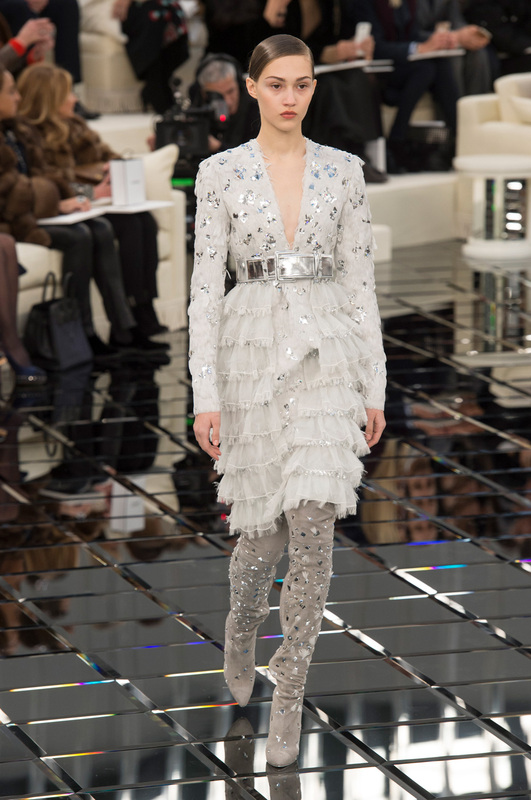 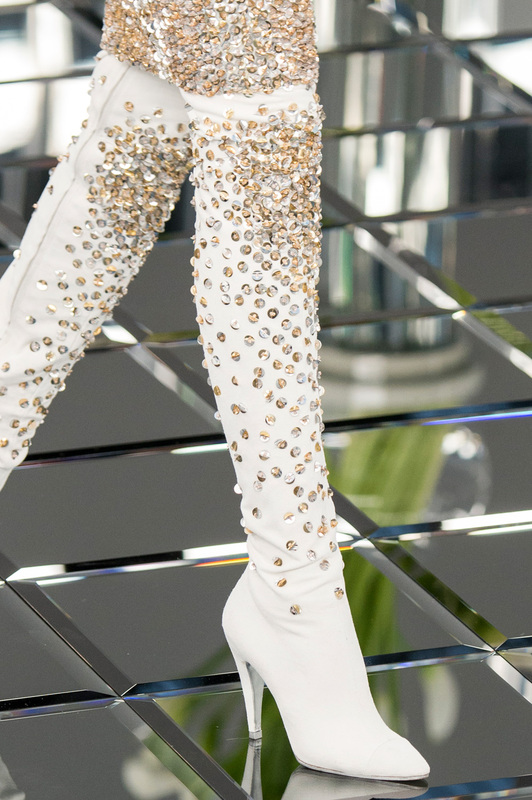 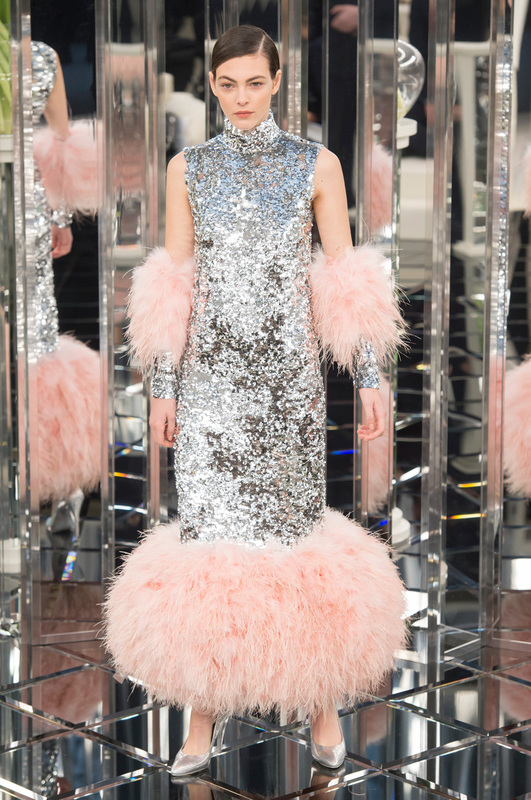 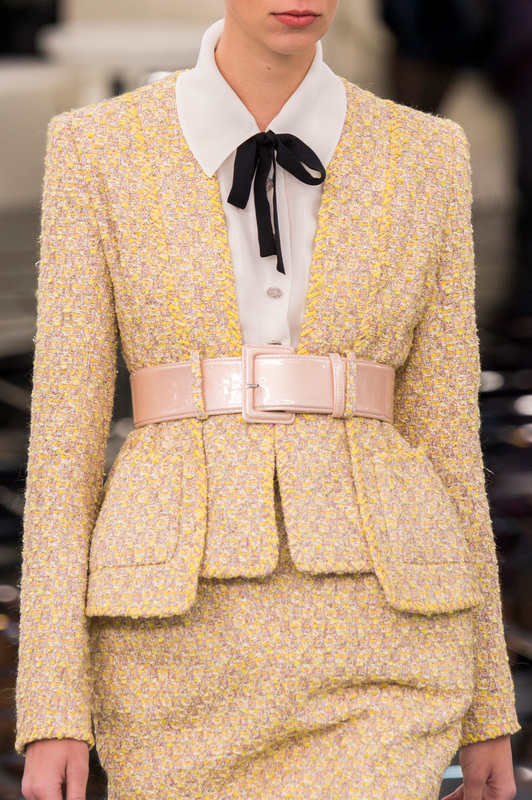 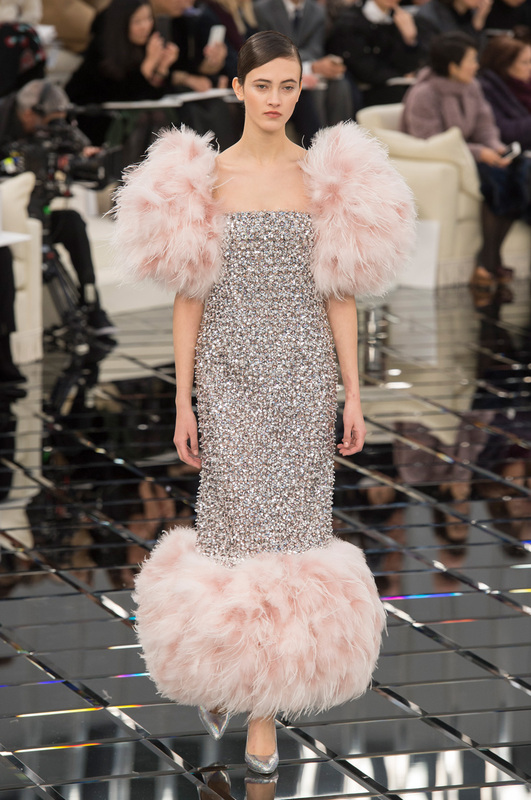 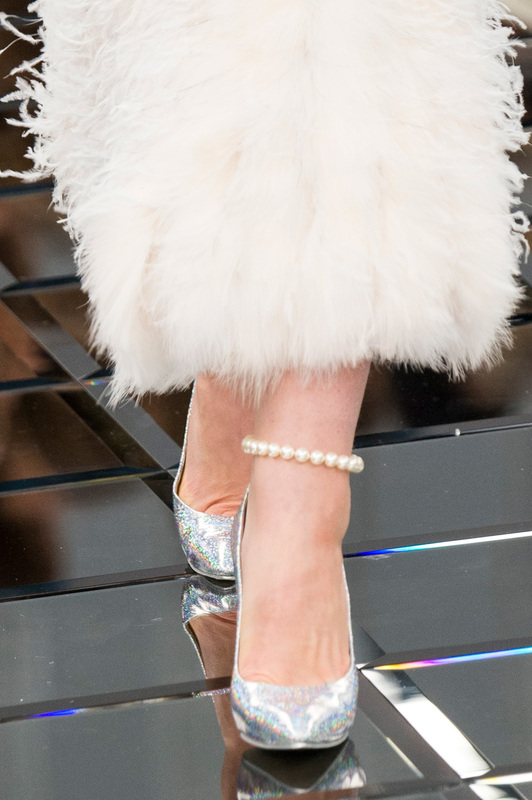 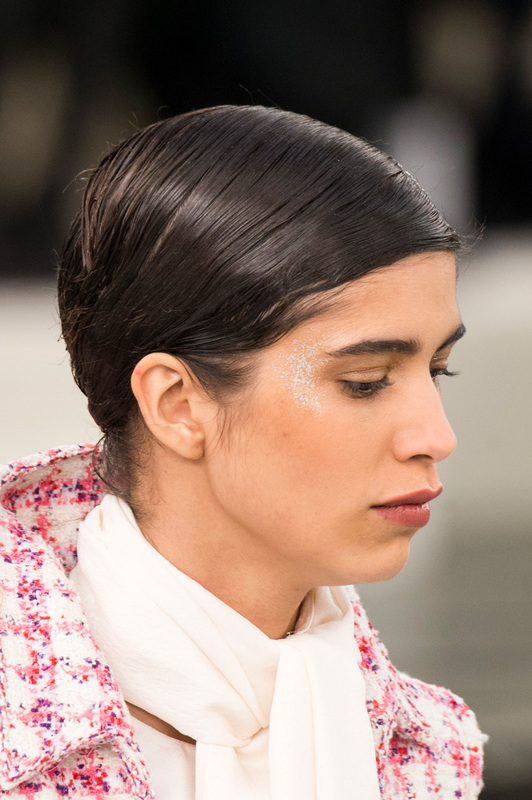 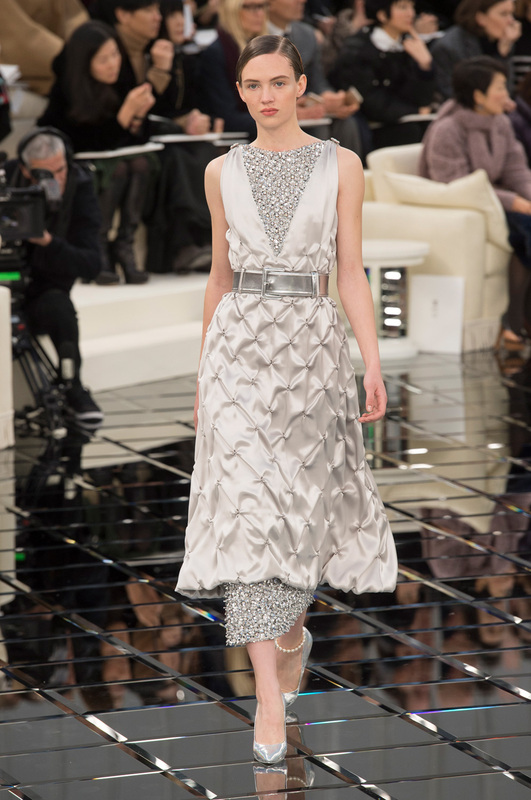 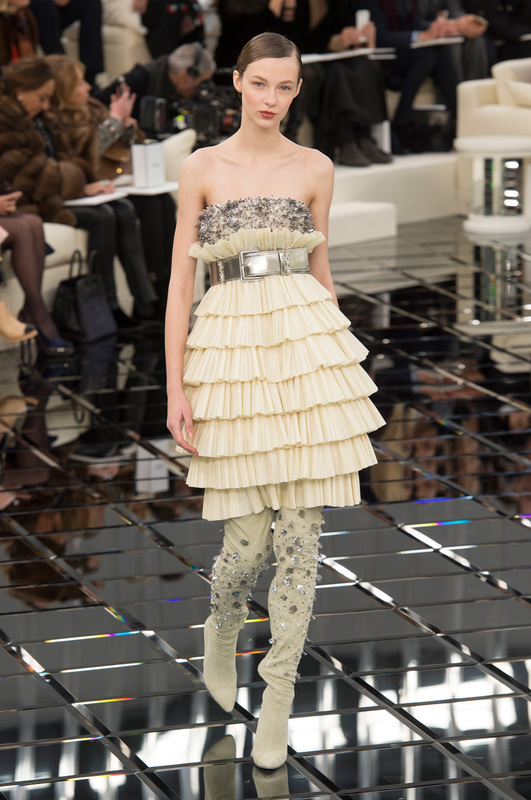 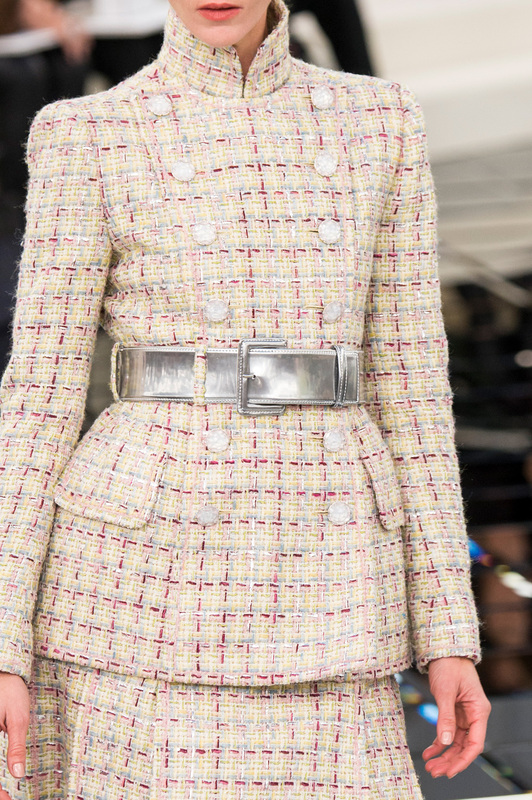 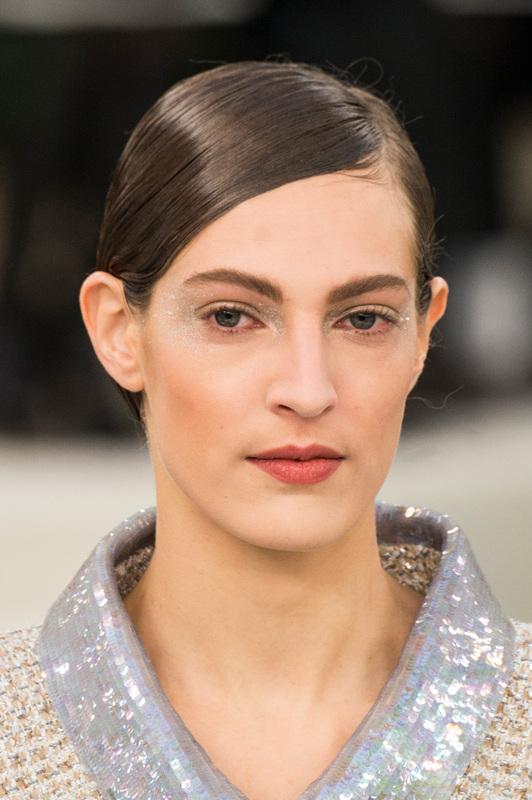 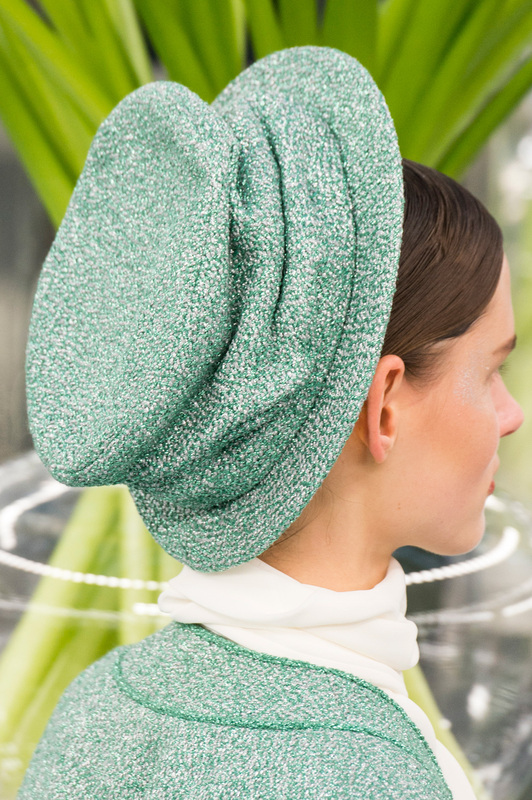 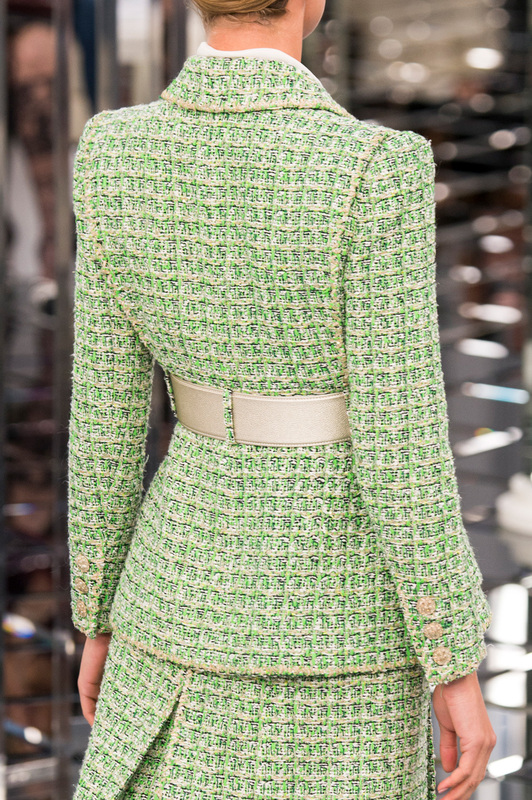 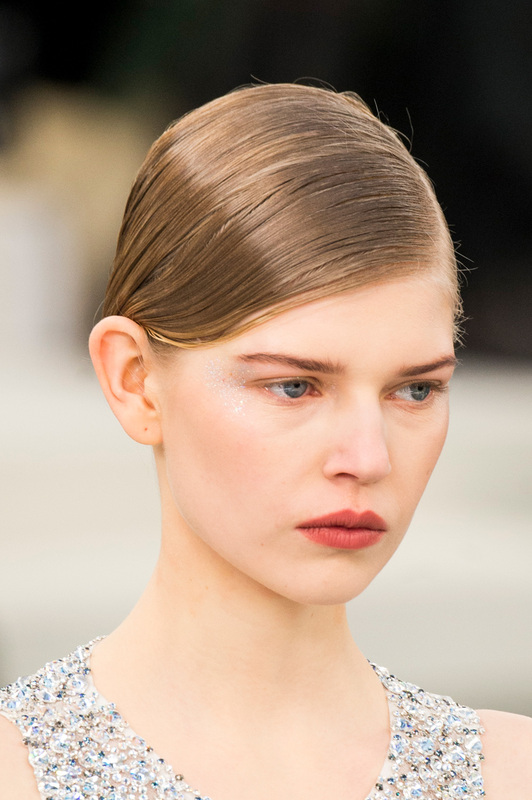 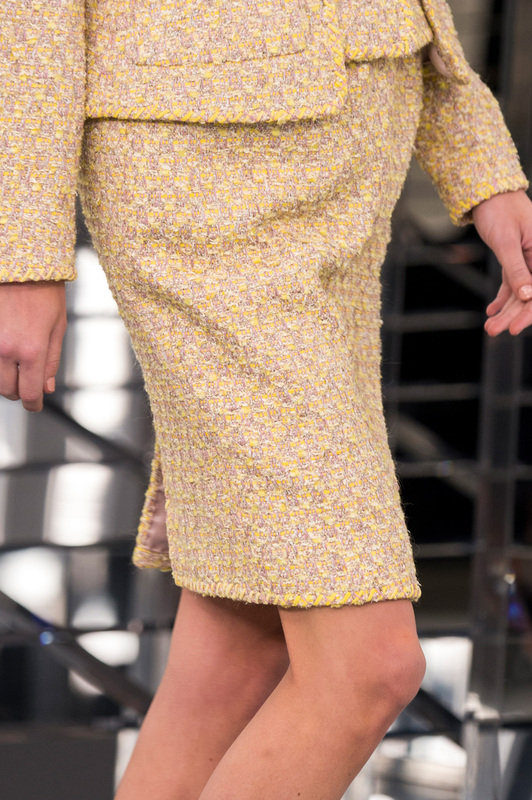 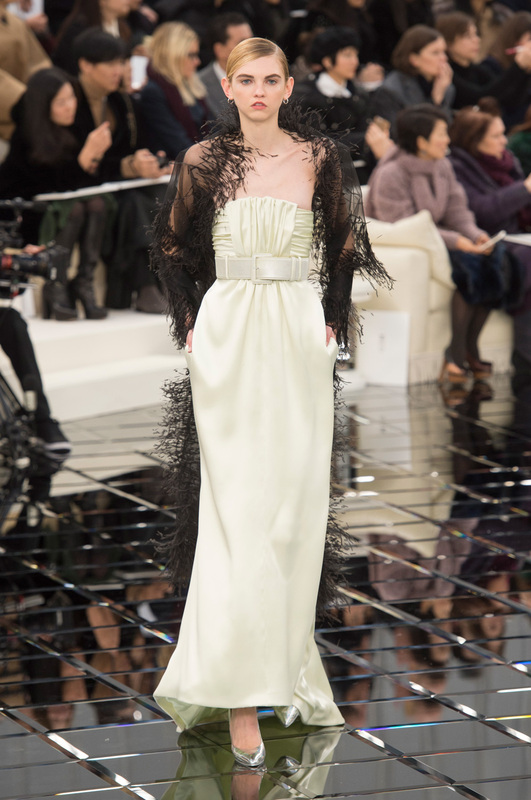 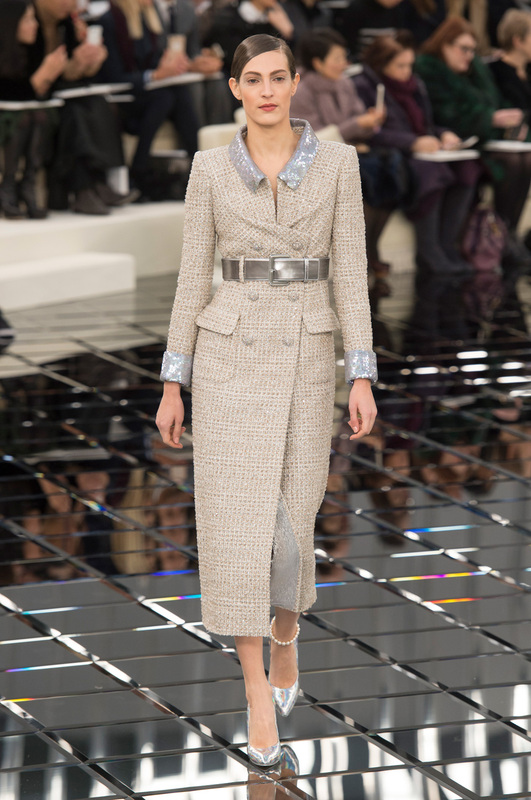 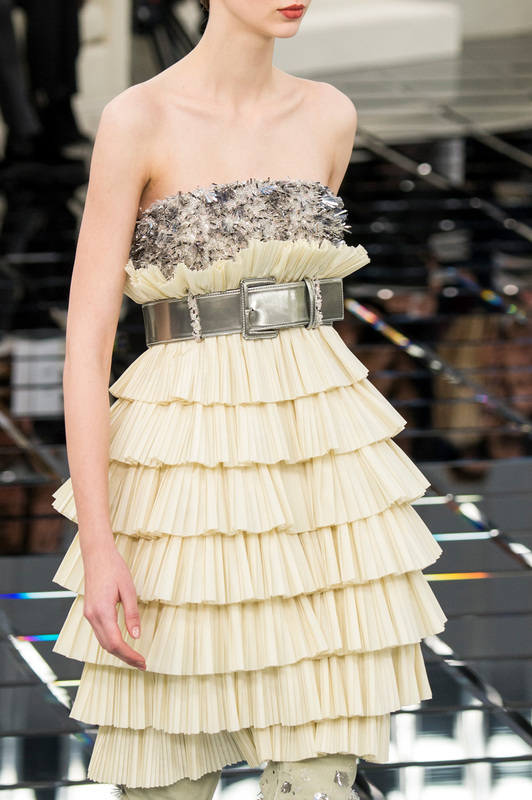 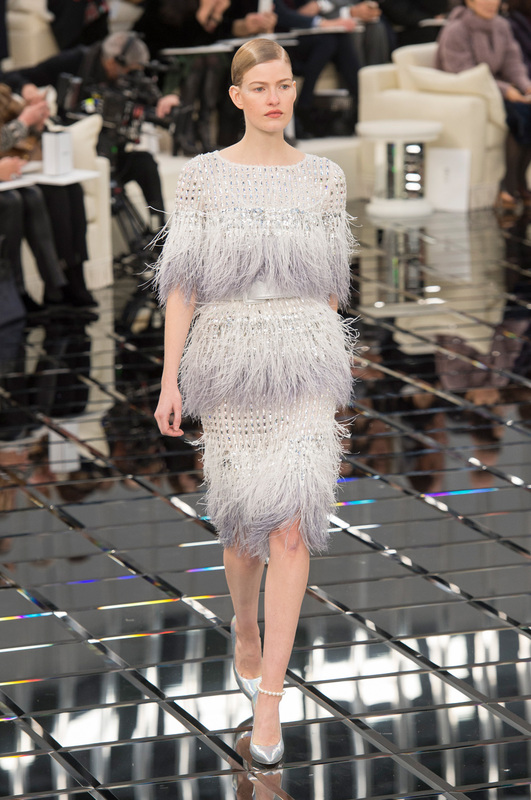 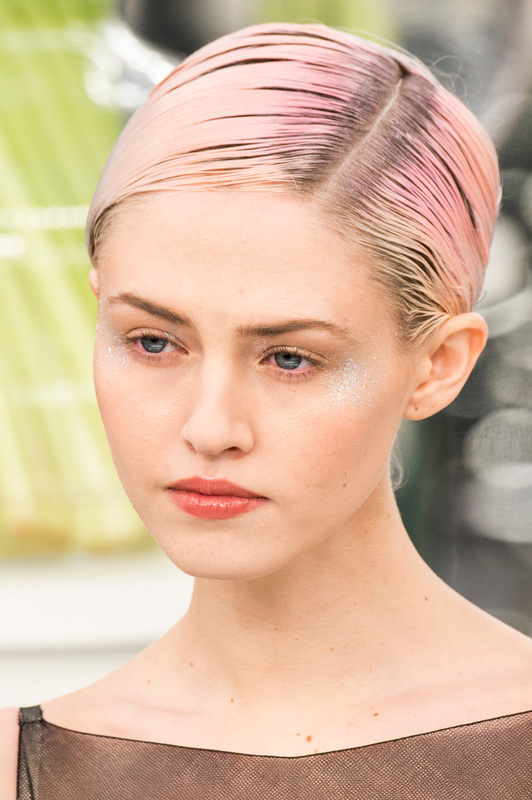 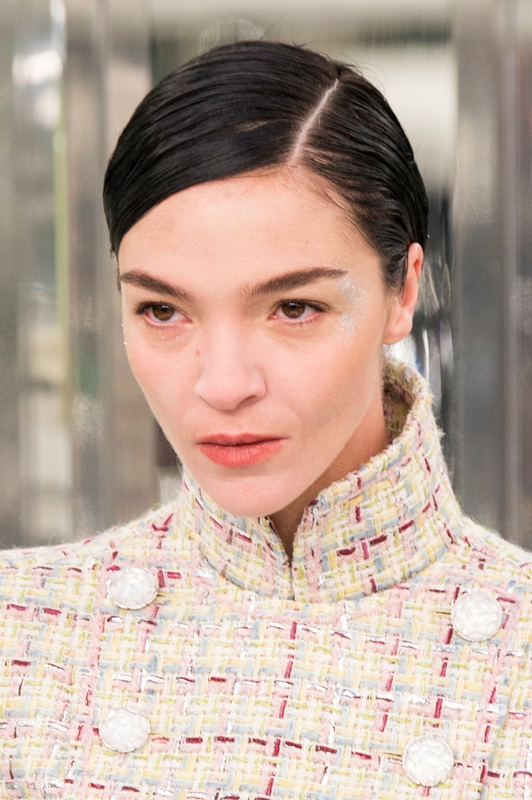 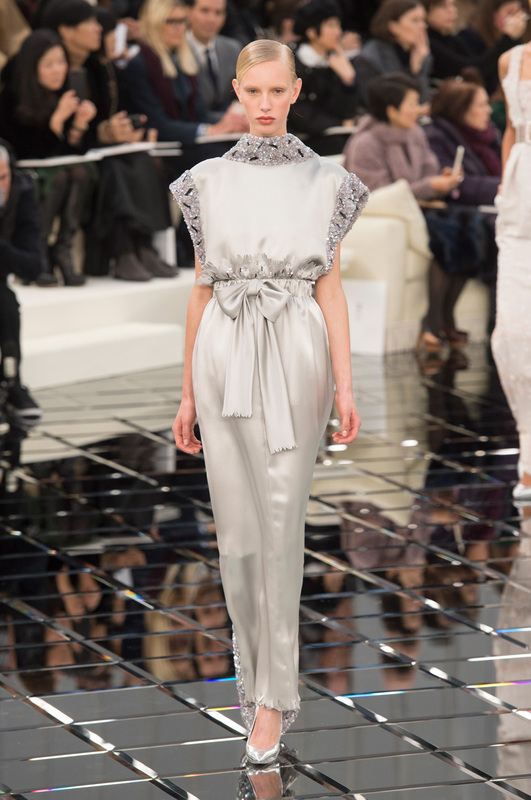 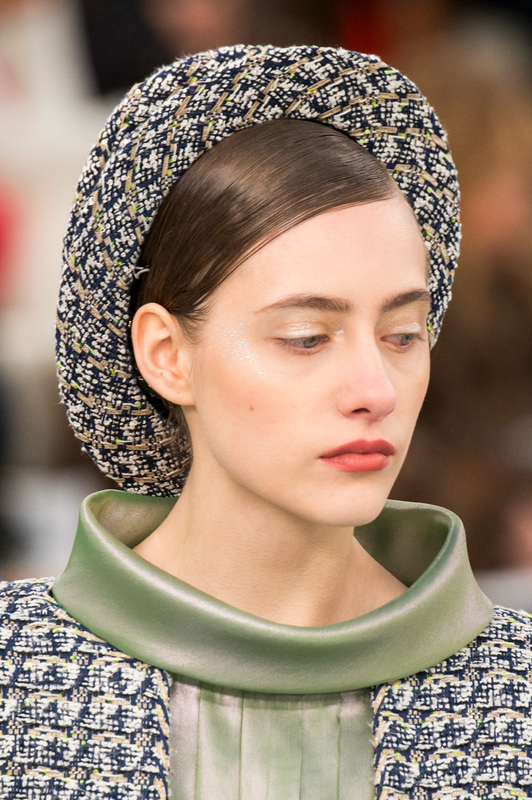 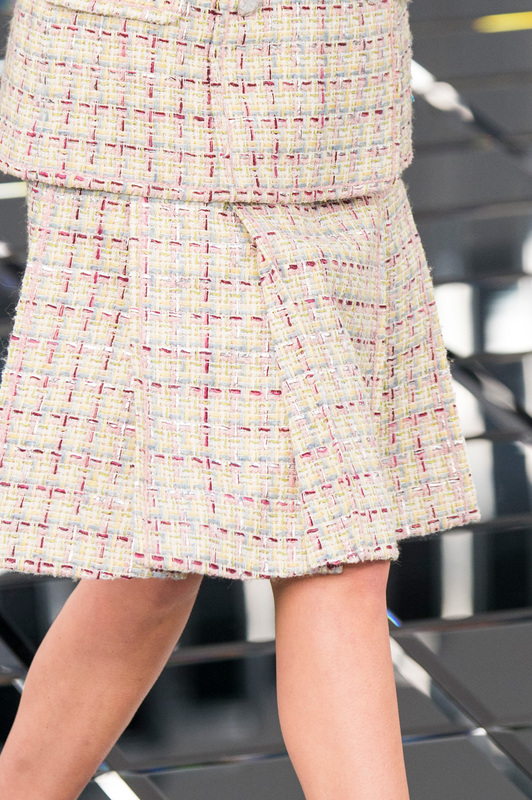 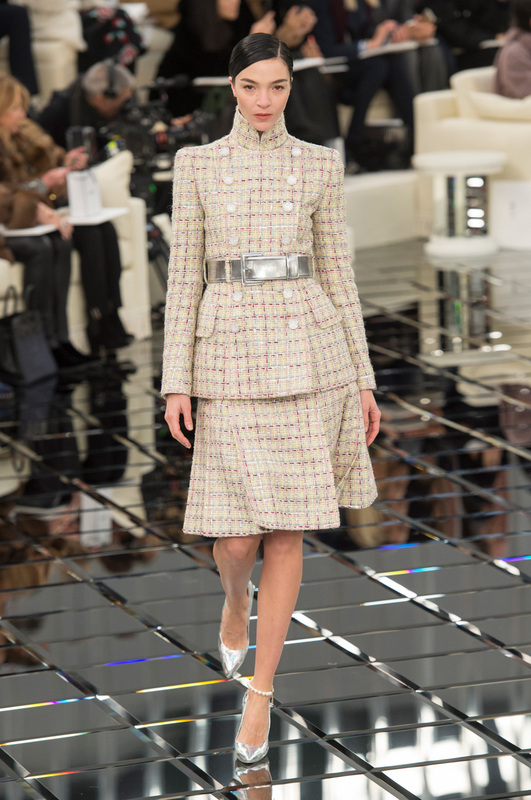 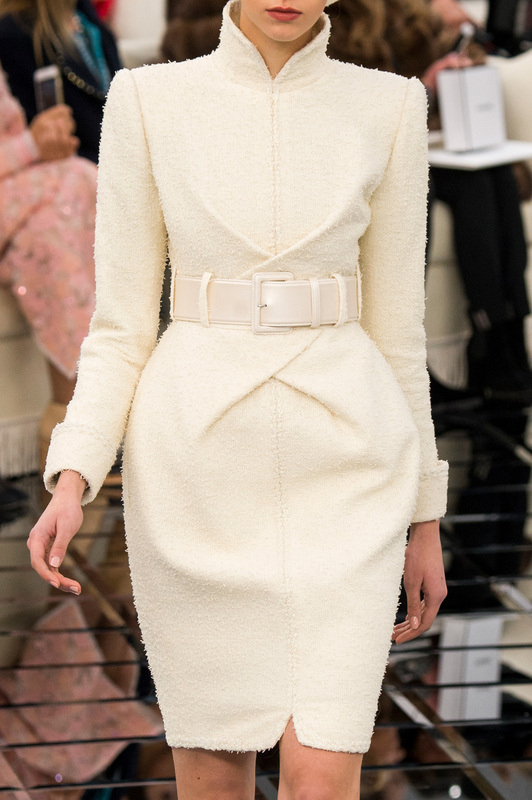 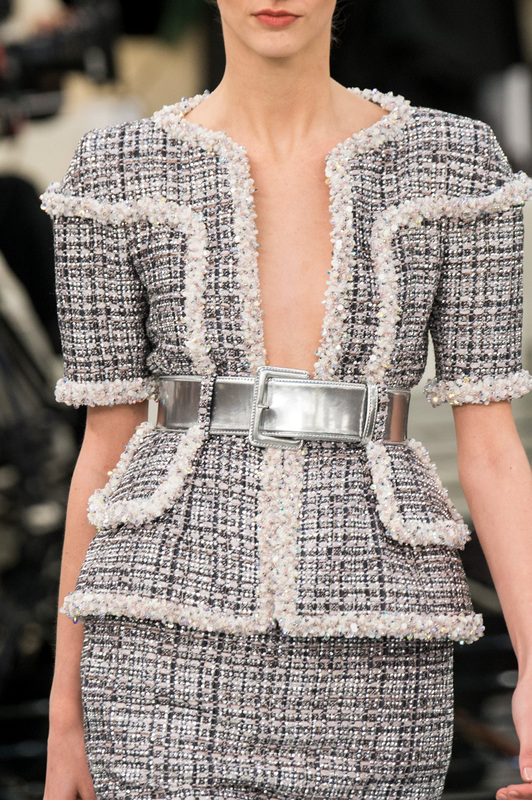 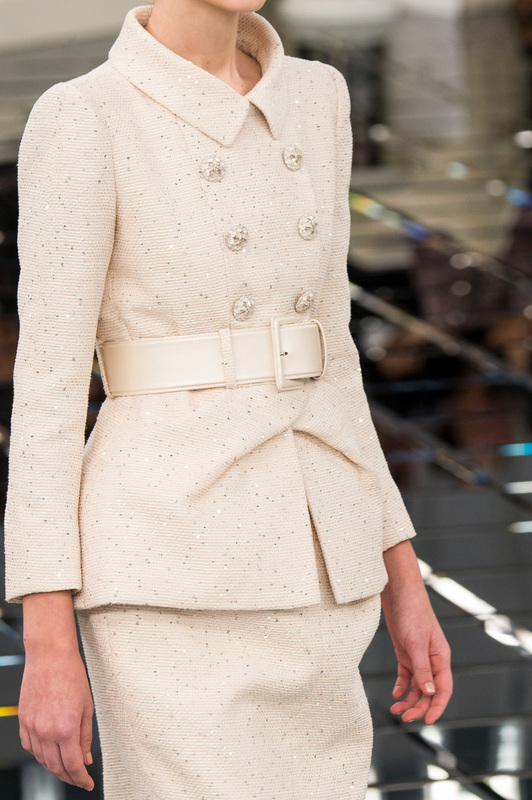 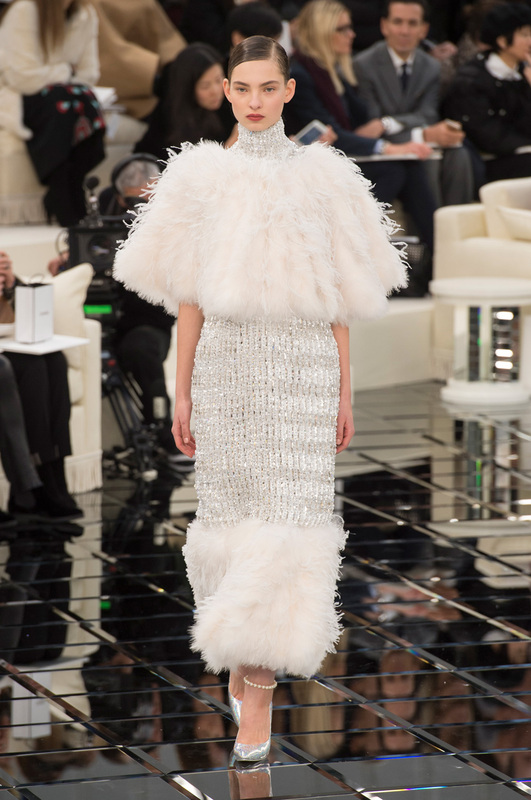 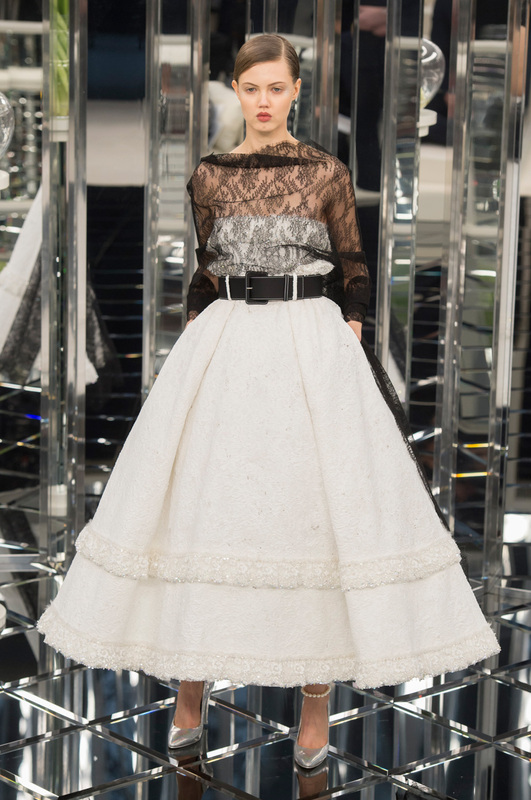 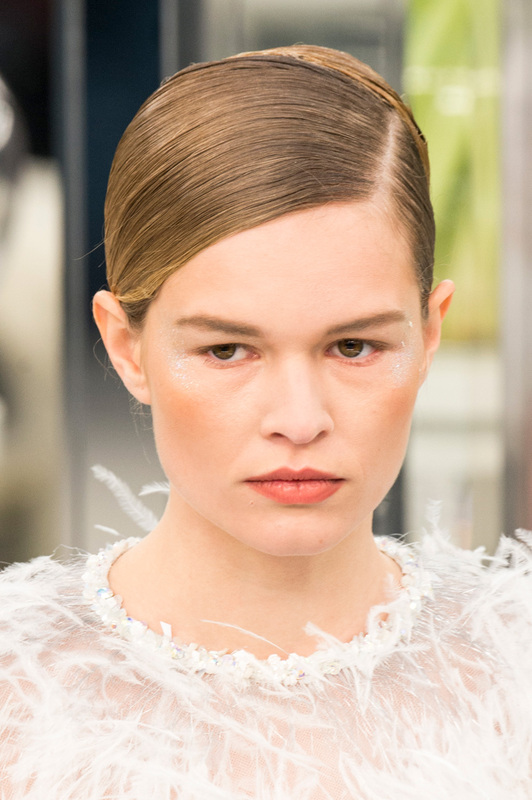 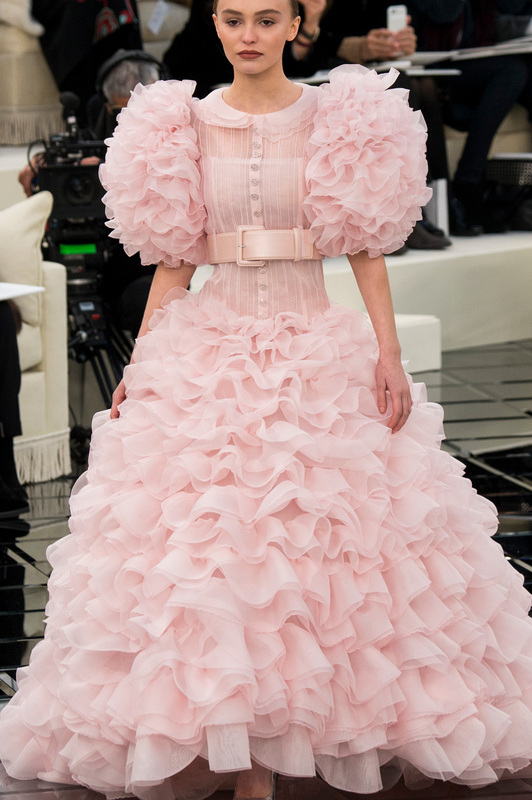 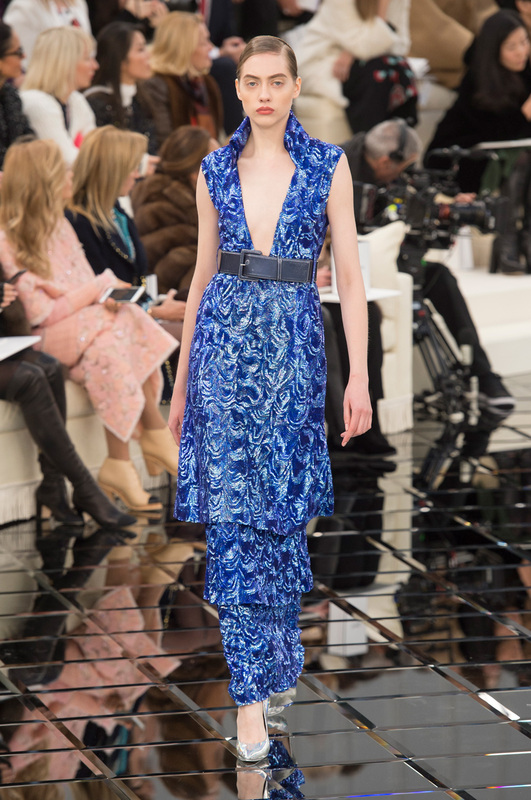 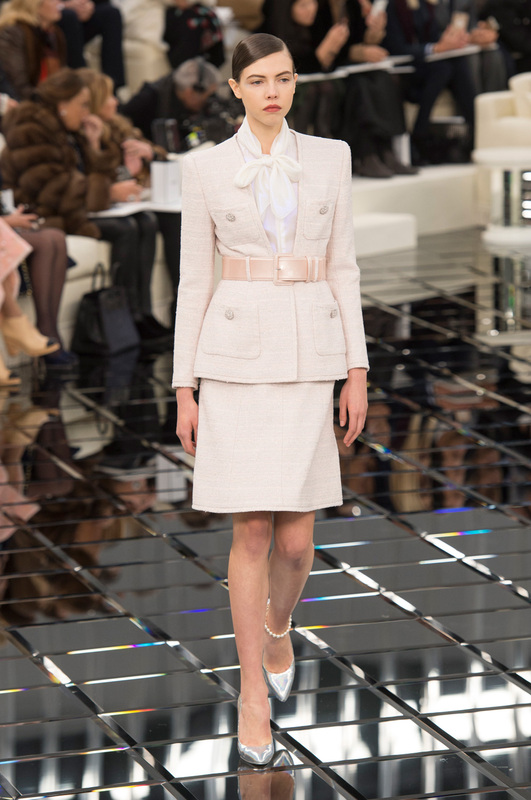 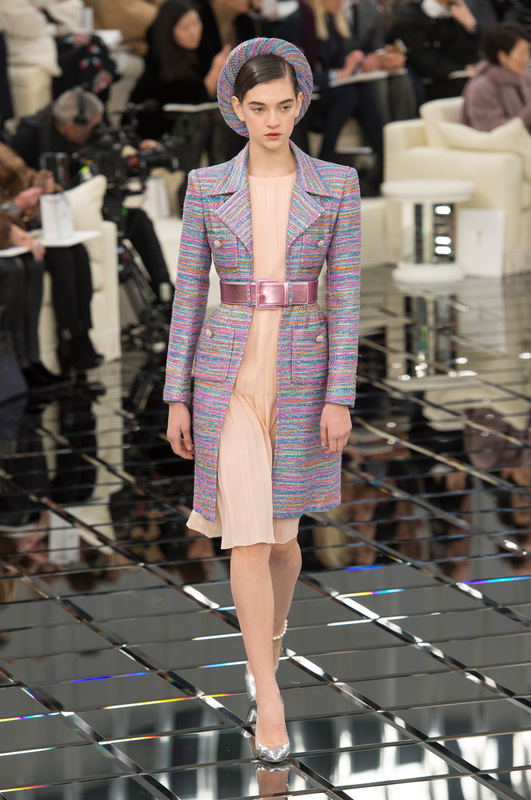 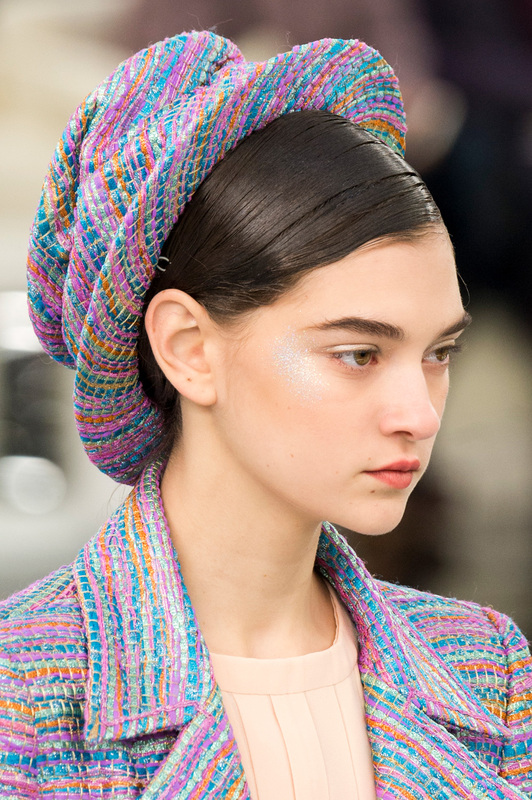 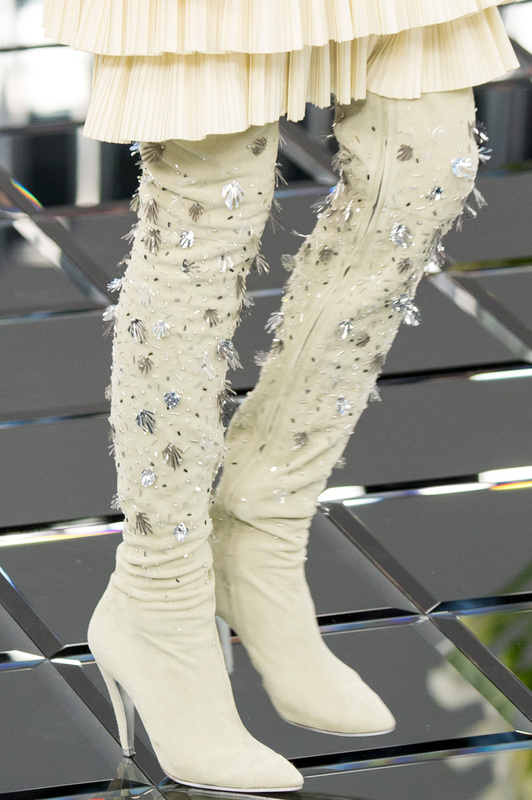 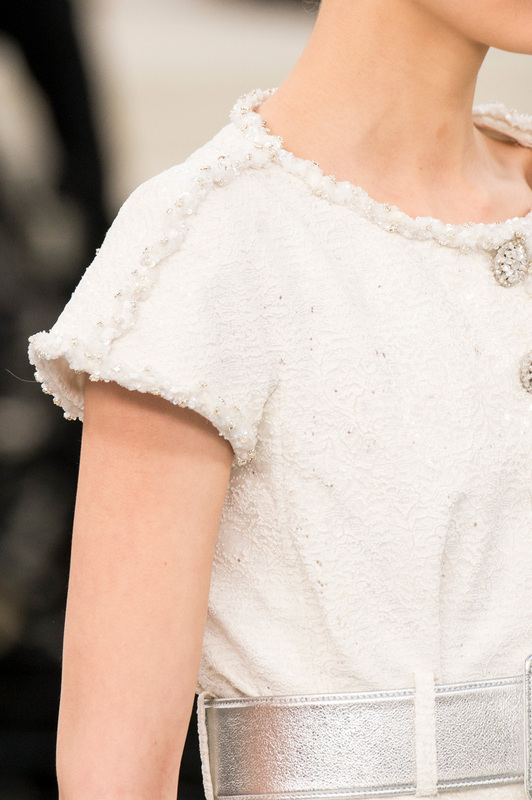 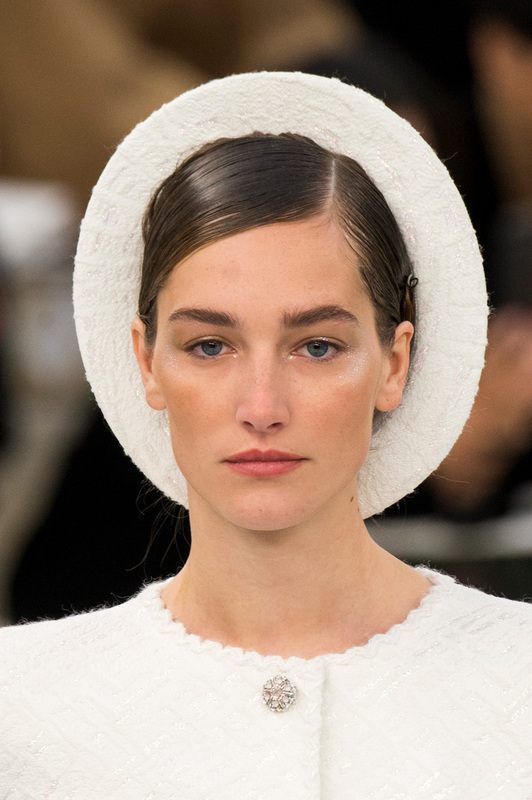 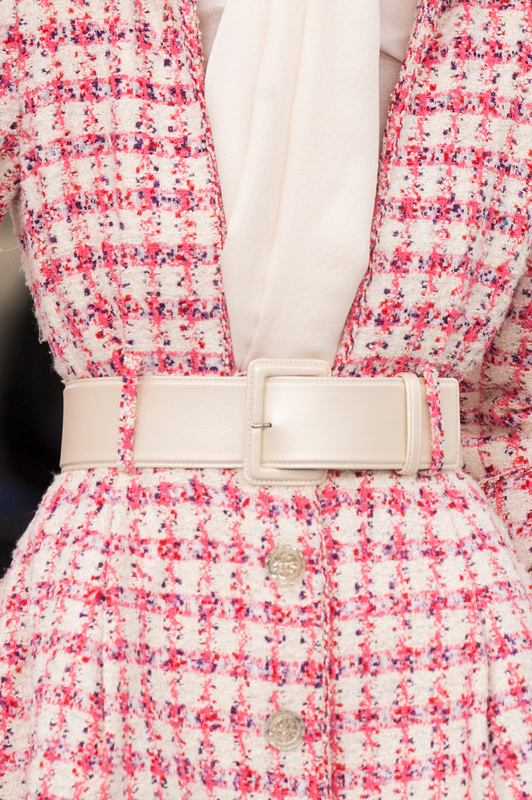 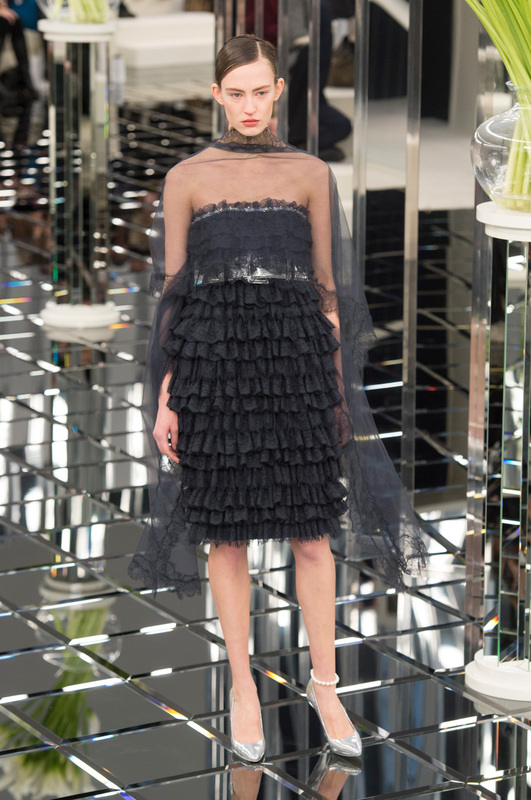 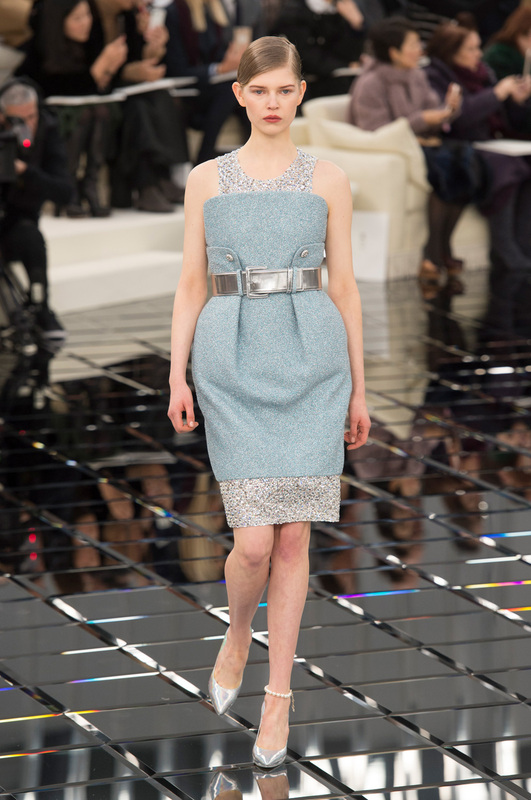 Chanel Haute Couture Spring-Summer 2017 – Chanel resonates chic classicism, with patterned two-piece suits maintaining an emphasis on tailoring and clean cut lines. 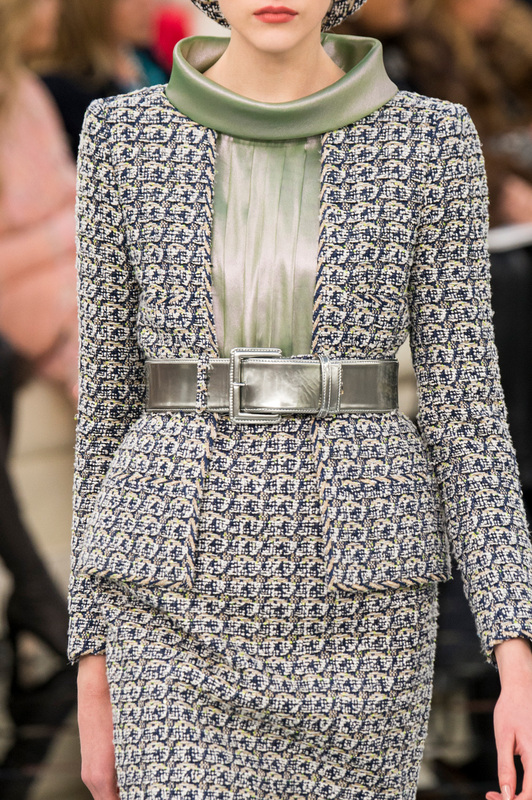 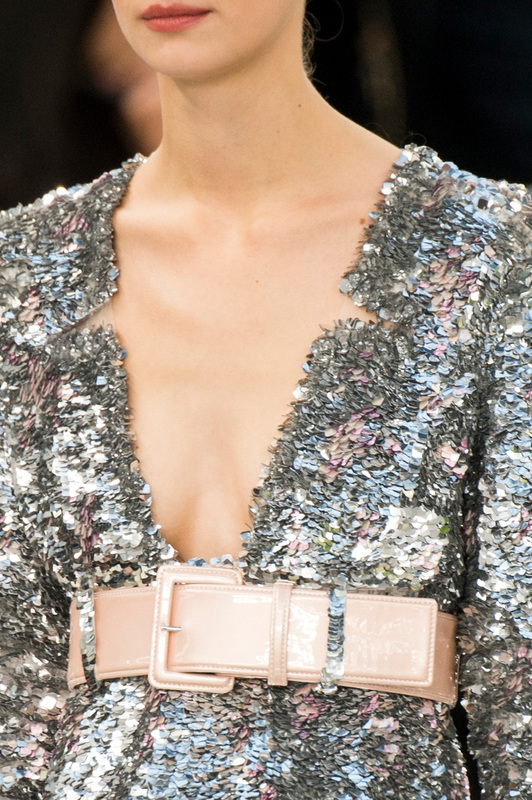 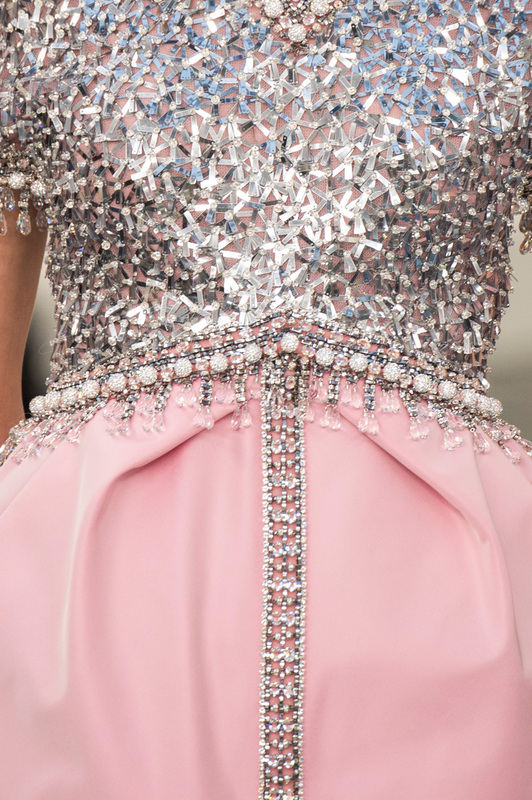 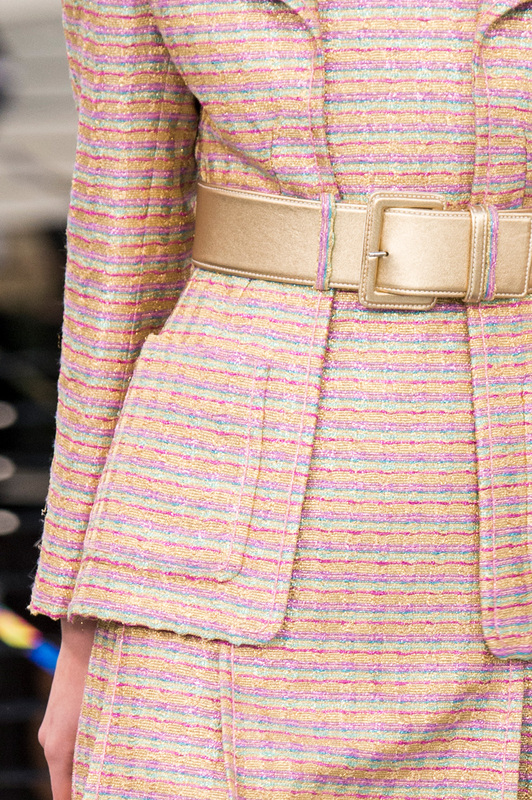 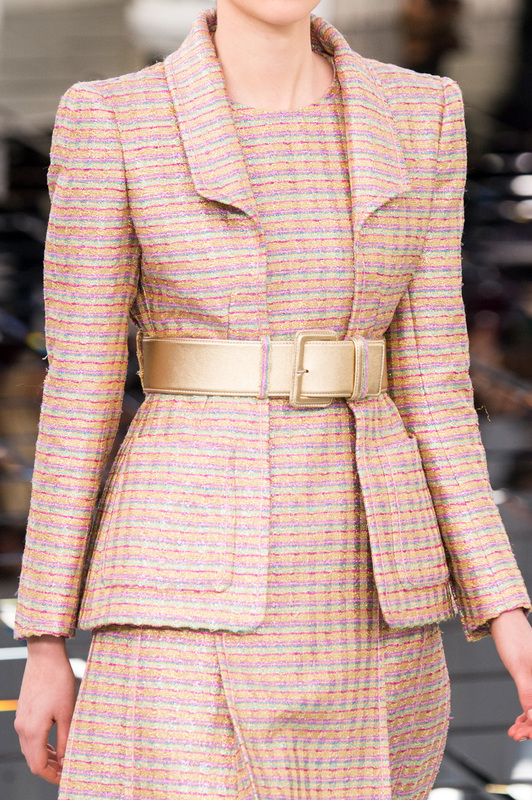 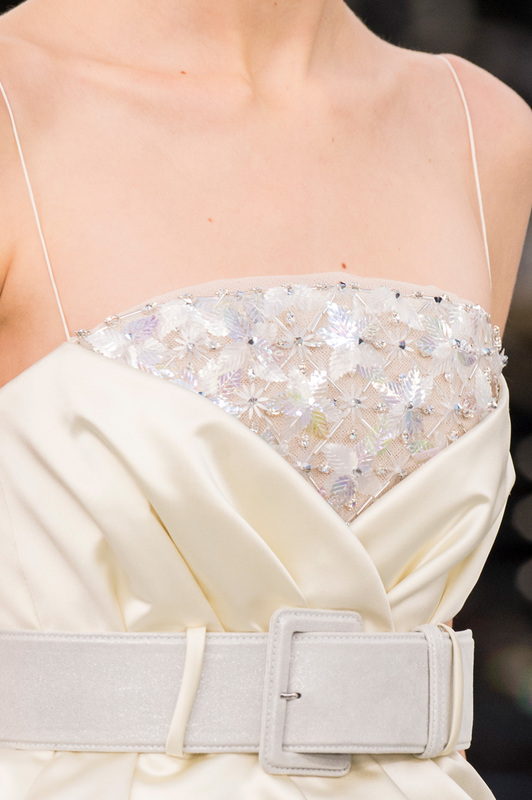 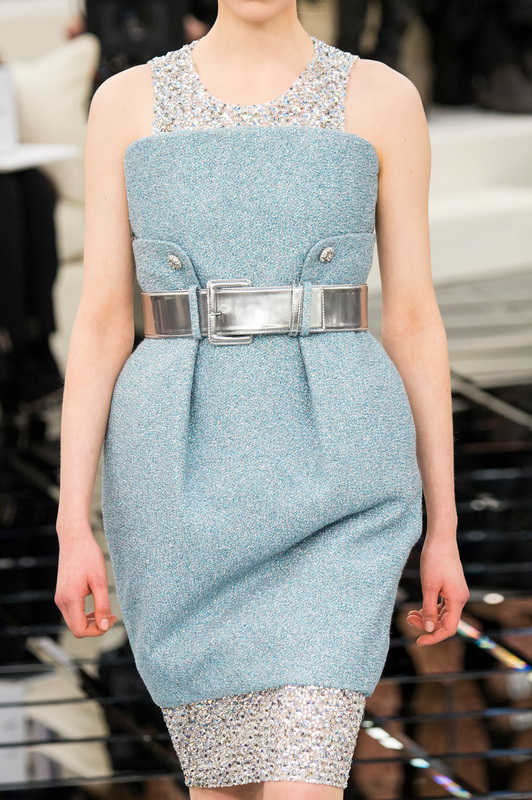 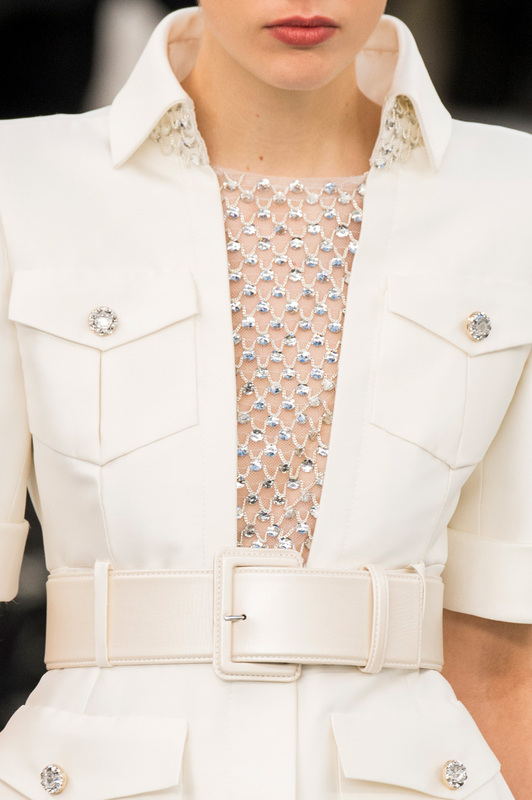 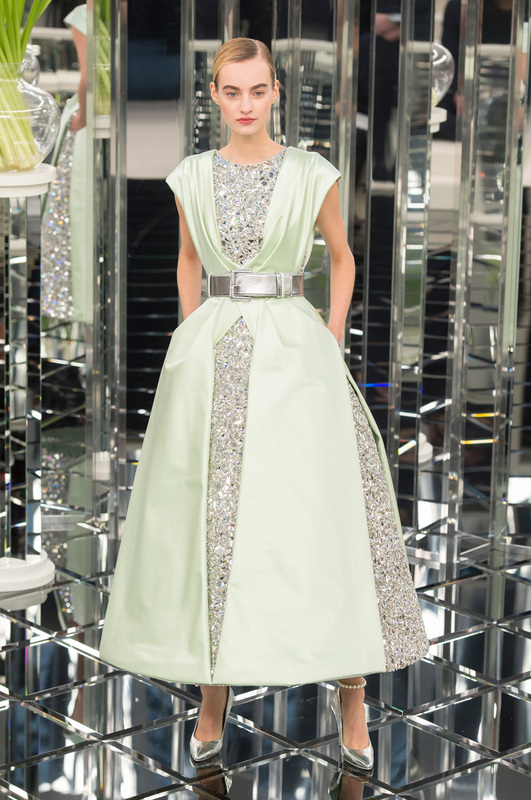 Colours remained within a neutral palette with the appearance of glitter and silver sequins, and metallic belts added contrast to the padded shoulders and wide collars by emphasizing a cinched in waist and subtle femininity, as is also replicated by pairings with barely-there heels. 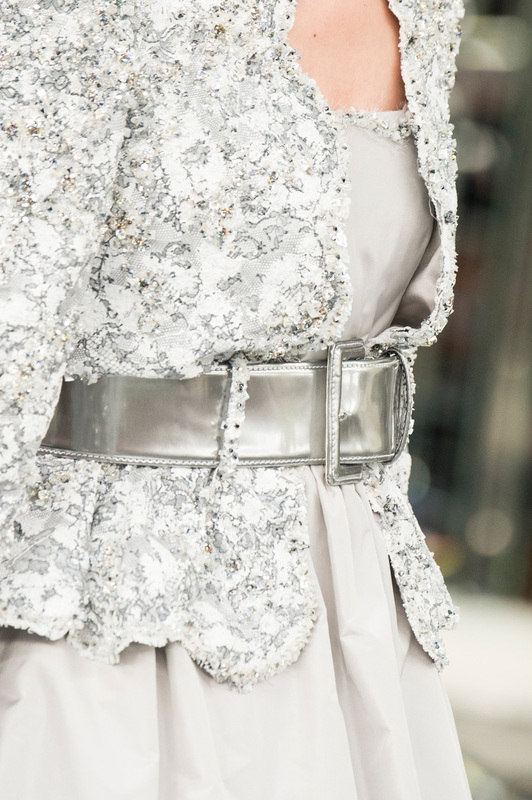 The metallic belts themselves cast the mind back to the style of the eighties, adding an effortless timelessness and dominance to the runway. 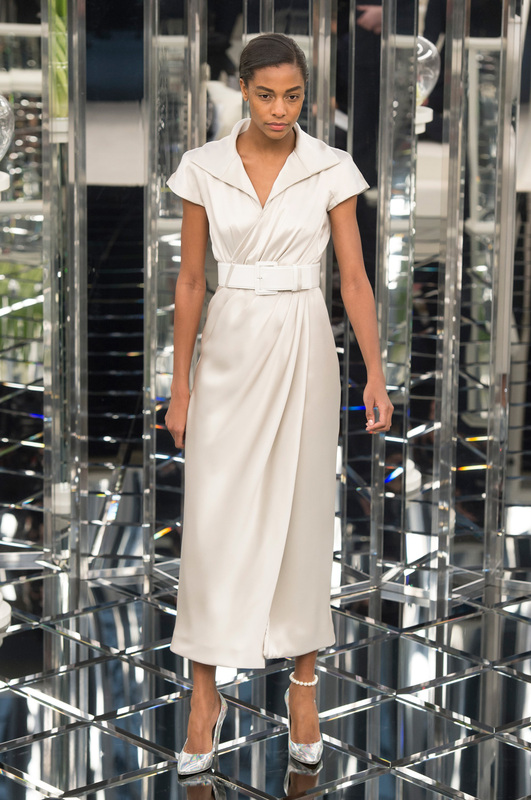 Full skirts cast ballerina like ideals, whilst straight, elongated lines were also shown in the appearance of jumpsuits and long skirts alike. 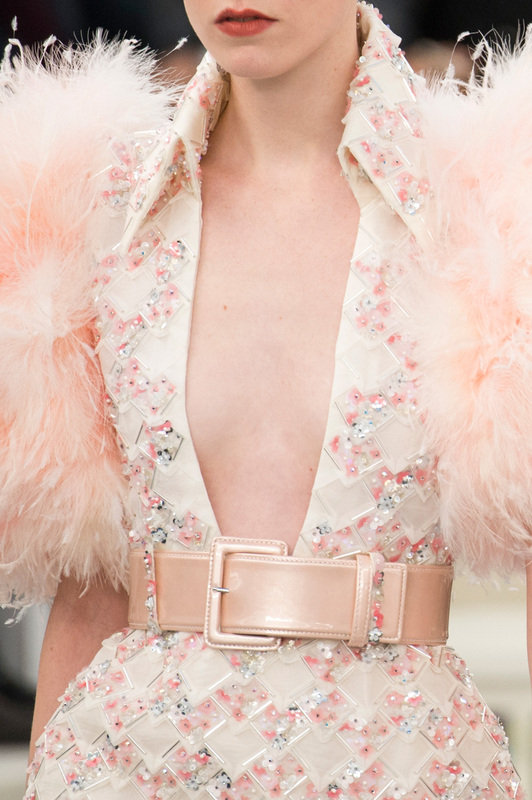 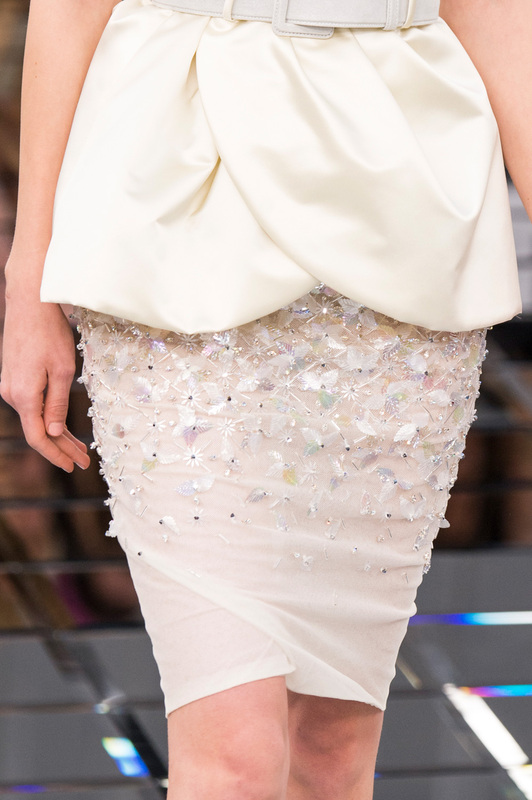 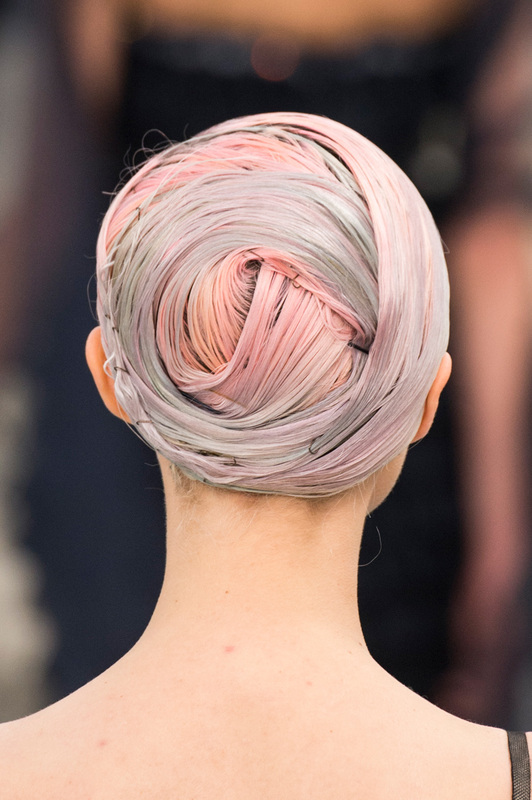 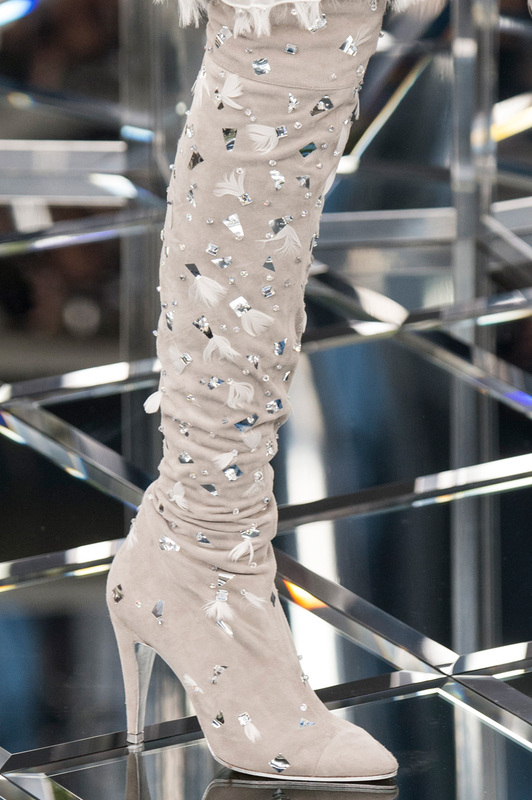 The addition of full feather accessories in a variety of pastel colours gave dynamism and texture to the pieces. 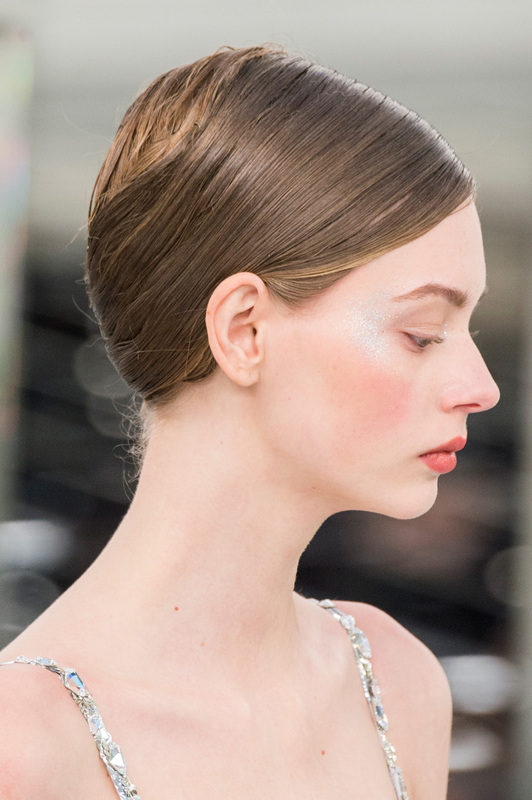 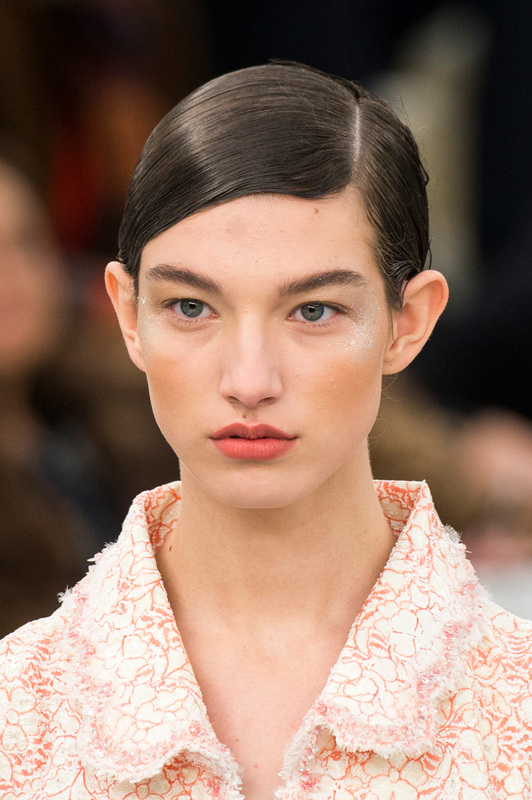 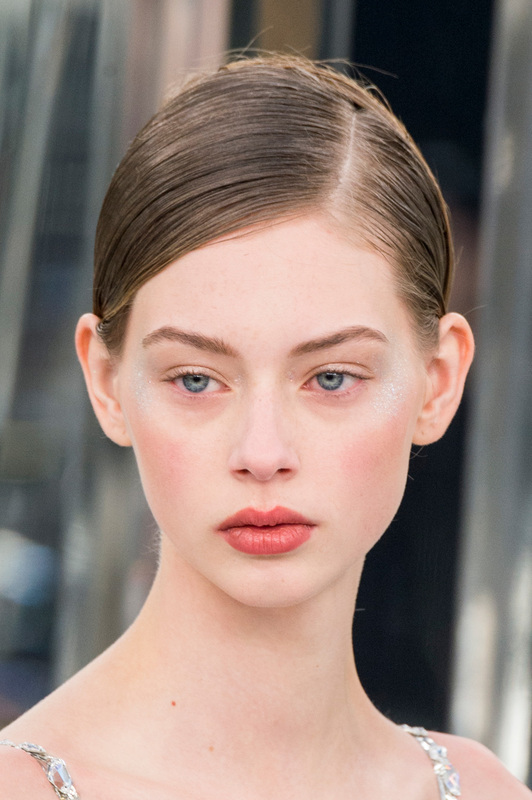 Dramatic side partings and slicked back hair emphasize the natural face structure and shape alongside minimalistic makeup. 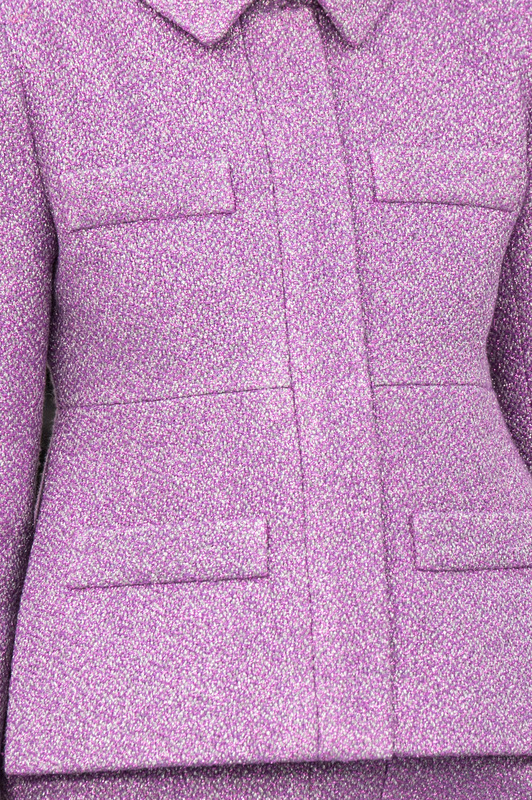 A second year undergraduate reading English at the University of St Andrews. 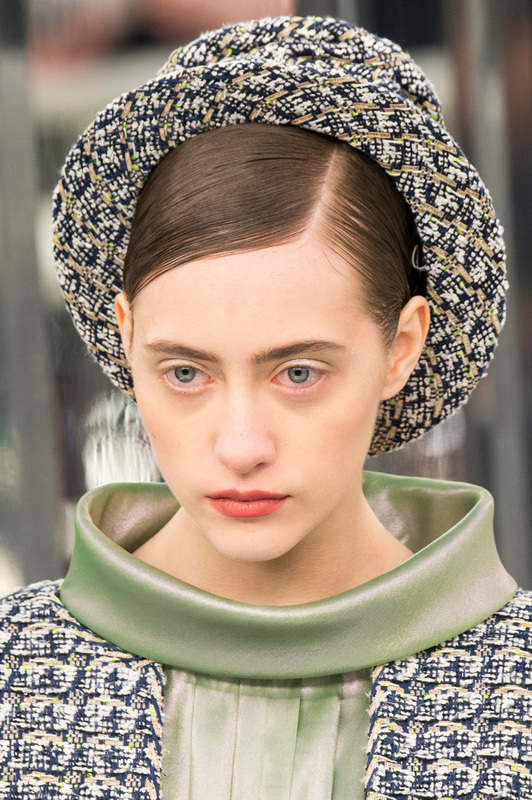 As well as having a keen interest in the fashion industry, loves books, writing and music as different forms of self expression.